African LCC group fastjet is in the middle of the largest expansion of its international route network since it commenced operations three years ago, with four new routes being launched in early 2016. Fastjet is now the largest LCC in Africa’s international market and plans further expansion throughout 2016, including from a new base in Zambia. Two newly launched routes to Kenya from its original base in Tanzania represent a breakthrough after three years of regulatory delays. Two new upcoming routes to South Africa from its second base in Zimbabwe are also a major milestone as they represent the first international routes outside Tanzania, a stepping stone in fastjet’s connect the dots pan-Africa strategy. Fastjet has huge opportunities for further growth – particularly after the suspension of services by flyafrica.com, the only other pan-African LCC group – but there are also huge challenges to overcome still, including regulatory hurdles and unfavourable economic conditions in some of its markets. The latest regulatory setback occurred in Malawi, prompting fastjet to suspend services to Lilongwe. This is the first in a series of analysis reports on fastjet. This first instalment will focus on the Kenya market, which is initially being served by the Tanzanian subsidiary, while the next instalment will focus on Zimbabwe, South Africa and the overall 2016 outlook for the group. Fastjet launched operations in late 2012 with a Tanzanian operating certificate and three A319s based at Dar es Salaam. Multiple regulatory setbacks prevented the group from launching several planned international routes from Tanzania and establishing affiliates in other African countries. As a result fastjet’s initial fleet was underutilised, impacting profitability, as the group was confined primarily to Tanzania’s relatively small domestic market. Fastjet Tanzania was finally able to launch its first international route in Oct-2013, from Dar es Salaam to Johannesburg, after eventually overcoming regulatory delays with South African authorities. It was able to launch three more international routes in 2014 – to Lusaka in Zambia, Harare in Zimbabwe and Entebbe in Uganda – enabling full utilisation of its initial fleet of three A319s. In 2015 there were more breakthroughs, as fastjet finally was able to secure an operating certificate from a second African country, enabling the Oct-2015 launch of fastjet Zimbabwe. The group also expanded its fleet for the first time since its late 2012 launch, adding two A319s in Tanzania and one A319 in Zimbabwe, for a total of six aircraft. However, 2015 was a challenging year for fastjet as it continued to face regulatory challenges in several markets while demand dropped significantly in its home market of Tanzania in 2H2015, due to weaker economic conditions and political uncertainty. Domestic demand was impacted for several weeks prior to the late Oct-2015 presidential elections. Demand remained weak in the last two months of 2015 as the new government took over and gradually put in place new ministers and policies. Fastjet’s load factor dropped to only 60% in Nov-2015 compared with 77% in Nov-2014. 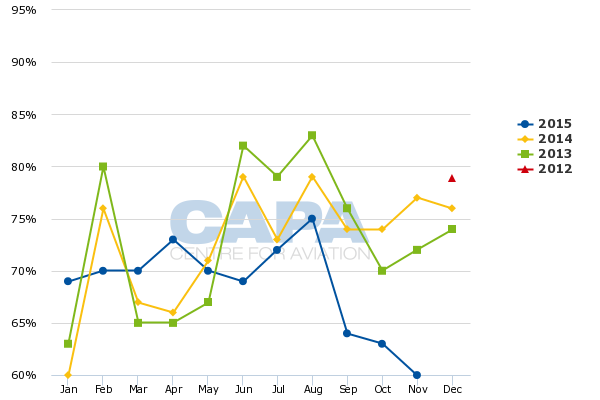 Its load factor was only 63% in Oct-2015, and 64% in Sep-2015. While the group was finally able to launch an affiliate in Zimbabwe in 2015, it encountered further delays in launching a planned affiliate in Zambia. Initially fastjet Zambia was expected to launch in 2014, well ahead of fastjet Zimbabwe as the Zambia project began about a year earlier. During most of 2015 the group continued to face regulatory delays in Kenya, where it has been trying since 2013 to launch a local affiliate, and to launch flights from Tanzania using the Tanzanian operating certificate. There were also setbacks in securing approvals for Blantyre in Malawi, and planned fifth freedom routes from Entebbe in Uganda. In Dec-2015 Kenyan authorities finally approved fastjet Tanzania’s longstanding application for flights to Nairobi from Dar es Salaam and Kilimanjaro. This likely represents the biggest breakthrough in fastjet’s four year history, as Kenya is the largest international market from Tanzania, and the green light for Tanzania-Kenya services could lead to approvals of other fastjet group Kenya-related proposals. There were about 16,000 weekly seats in the Tanzania-Kenya market prior to fastjet’s entry on 11-Jan-2016. As Kenya accounts for over 25% of Tanzania’s international market, there was a gaping hole in fastjet Tanzania’s network. Prior to fastjet’s entry, Kenya Airways accounted for about 65% of seat capacity between Kenya and Tanzania. 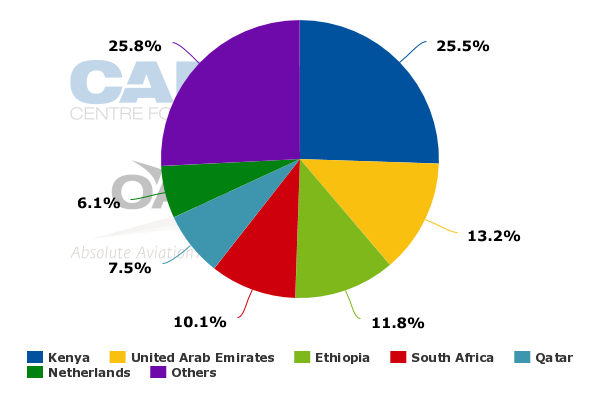 Tanzanian regional carrier Precision Air Services accounted for about another 29%, according to CAPA and OAG data. As Kenya Airways has a partial stake in and codeshares with Precision Air, the Kenyan flag carrier enjoyed a virtual monopoly in the Kenya-Tanzania market. Kenya-Tanzania fares have historically been some of the highest in the world for a short haul route – sometimes in excess of USD1000 for a return flight. Fastjet has entered with one-way fares from USD50 on Kilimanjaro-Nairobi, and from USD80 on Dar es Salaam-Nairobi (excludes airport taxes of USD49 for Tanzania departures and USD40 for Kenya departures). Fastjet launched services to Kenya on 11-Jan-2016, with one daily flight on both the Kilimanjaro-Nairobi and Dar es Salaam-Nairobi routes. As a result, fastjet now has about 4,200 seats in the Tanzania-Kenya market, giving it about a 20% share and breaking Kenya Airways’ virtual monopoly. Kenya Airways currently has five daily flights on Dar es Salaam-Nairobi and 10 weekly flights on Kilimanjaro-Nairobi, using Embraer 190s. Precision Air, which has an all ATR turboprop fleet, has four weekly flights on Dar es Salaam-Nairobi and three daily flights on the shorter Kilimanjaro-Nairobi route. Not surprisingly, average fares on both routes from all carriers have quickly tumbled. Fastjet is confident that the market will grow significantly in size as its low fares entice passengers who were previously travelling between Tanzania and Kenya on buses. Fastjet has succeeded at stimulating demand in every domestic and international route it has entered, and estimates that about 40% of its passengers to date have been first time fliers. Fastjet is keen to add flights to Kenya over the next several months. In addition to adding capacity on its initial two Kenya routes, it has applications for services from Zanzibar to Nairobi, and from Dar es Salaam to Mombasa, that are still pending. Dar es Salaam-Mombasa is currently not served non-stop by any carrier. Zanzibar-Nairobi is served with two daily flights from Precision Air and 11 weekly flights from Kenya Airways. Precision also has three weekly flights to Nairobi from Mwanza, a secondary Tanzanian city already served by fastjet from both Dar es Salaam and Kilimanjaro. Nairobi gives fastjet Tanzania five international destinations, but Nairobi is already by far its largest international destination and accounts for 42% of its total international seat capacity. While fastjet Tanzania aims to extend its network to more countries, Kenya has the potential to support significantly more capacity. Other existing, and potential new, international destinations are much smaller markets and – even factoring in stimulation – are unlikely to support more than one daily flight. Fastjet Tanzania’s other international routes include Dar es Salaam-Johannesburg (daily), Dar es Salaam-Lusaka-Harare-Dar es Salaam (daily), Dar es Salaam-Lilongwe (twice per week) and Kilimanjaro-Entebbe (three times per week). Johannesburg was upgraded to daily in Sep-2015 and, at least for now, is not mature enough to take additional frequencies. Fastjet initially operated Lusaka and Harare as separate three weekly non-stop services before switching to the current daily circular routing in 2015. Fastjet is planning to suspend Lilongwe on 8-Feb-2016, since it still has not been able to secure approval for Blantyre. Fastjet launched twice weekly Dar es Salaam-Lilongwe service in Jul-2015, with the anticipation of extending the route to Blantyre within a couple of months and increasing capacity to four weekly flights. However, fastjet has still not been able to secure approval for Blantyre, which it believes is crucial for sustaining service to Malawi as Blantyre is the bigger market. The suspension of Lilongwe is sensible as the market is too small to become profitable on its own, and fastjet is now better off reallocating this capacity to Kenya. Fastjet would still be keen to resume Lilongwe later in 2016 if it is finally able to secure approval for a Dar es Salaam-Lilongwe-Blantyre routing. Fastjet has not been seeking pick up rights between Lilongwe and Blantyre, but needs both destinations to make a Malawi route sustainable over the long term. While fastjet Tanzania does not currently have the capacity to maintain Malawi it is looking to add at least one more A319 in 2016, which could be used to resume services to Malawi, expand in Kenya, and potentially launch other new international routes. The setback in Malawi is frustrating, as other African carriers are able to combine Lilongwe and Blantyre. It also shows again that in Africa every regulatory victory often comes with at least one setback. Fastjet has also been set back in Entebbe with its attempts to launch fifth freedom flights. As CAPA has previously noted, Uganda is liberal, and in late 2014 it approved fastjet applications to operate fifth freedom routes from Entebbe to Nairobi, Juba, Kigali and Johannesburg. Nairobi is the most attractive of these markets as it is by far the largest route from Entebbe. Fastjet has since then run into roadblocks from Kenya and the other three countries, which have still not approved any of the planned fifth freedom routes. Fastjet is not likely to increase operations from Tanzania to Uganda, which is a very small local market, until it is able to launch fifth freedom sectors. Entebbe-Nairobi fifth freedom rights could finally be secured in 2016, since Kenyan authorities appear to have finally become more receptive to fastjet, and LCC competition generally, following recent breakthroughs in finally securing Dar es Salaam-Nairobi and Kilimanjaro-Nairobi approvals. However, Kenyan authorities may also remain reluctant, as they traditionally have been protective of Kenya Airways. Kenya Airways currently has a leading 68% share of seat capacity on the Entebbe-Nairobi market and currently operates five daily flights on the route. Rwandair has 10 weekly flights, while Kenyan regional carriers Fly540 and Fly-SAX each operate six weekly flights, according to OAG data. Entebbe and Harare, along with Zanzibar, could potentially give fastjet five international routes from Nairobi by the end of 2016. This would be a remarkable accomplishment, given that it took three years to enter the Kenyan market. There are huge opportunities in Kenya’s regional international market for LCCs. With its new two daily flights to Kenya fastjet is already the largest LCC in Kenya’s international market. Air Arabia is the only other foreign LCC serving Kenya, with one daily flight from Sharjah to Nairobi. Kenya Airways budget subsidiary Jambojet currently only operates domestic services, although it could potentially be used in the international markets as competition with fastjet, and potentially other LCCs, intensifies. A new potentially more liberal attitude from Kenya would also help fastjet’s long delayed attempt to obtain a Kenyan air operators’ certificate (AOC), which would enable the group to launch domestic services in Kenya, as well as more international routes. The group has been talking to several potential Kenyan investors, after deciding in 2014 to dispose of its stake in Fly540 Kenya – acquired in 2012 and originally envisaged as a potential platform for establishing an operation in Kenya. Fastjet Kenya secured an air services licence from Kenyan authorities in Oct-2015, enabling it to start the formal process of applying for an AOC. Fastjet Kenya remains an important component of the long term fastjet strategy for connecting all the major markets of southern and eastern Africa. However, Kenyan authorities are likely to open up only gradually, particularly given the recent financial problems at Kenya Airways, which the government has traditionally protected despite the obvious consumer and economic benefits of LCC competition. In the second half of this report on fastjet CAPA will look at the upcoming expansion of fastjet Zimbabwe to South Africa, and the overall outlook for the group in 2016.